Client: I want to take my gel nails off and go with regular manicures. I read that UV lamps are dangerous. You: I’ve read that, too, so I researched it, and I found some interesting information. At first, the only studies saying UV lamps are safe were done by industry leaders. Many people disregarded them, thinking, “of course they will say it’s safe since they’re the ones making the lamps.” So, I kept trying to find independent studies. Turns out, there’s a lot out there! You: Well, one study put out by a dermatology journal, tested the effects of 10 minutes under the UV lamp, which is about what you’d get during a manicure. They concluded the exposure doesn’t increase the risk of development of basal cell and squamous cell carcinoma. The study said the UV lamps are safe. Client: Then why do we hear so much about it? You: Well, I think it’s because two women who were getting regular gel manicures were diagnosed with skin cancer on their hands. Unfortunately, this led them to believe the lights were the cause of the cancer. In this dermatology study, they said that case review was anecdotal, which means it’s based on personal accounts, not facts. The media ran with it because it makes a dramatic news story. Client: I’m still not sure. You: I have a couple of options that may put you more at ease. First, we can protect your hands with sunscreen. I use an SPF 30. That’s excellent protection, but if you’re still not convinced, you can put your hands in these protective gloves, which cover your hands, but allow your fingernails to peek out so we can complete the manicure. 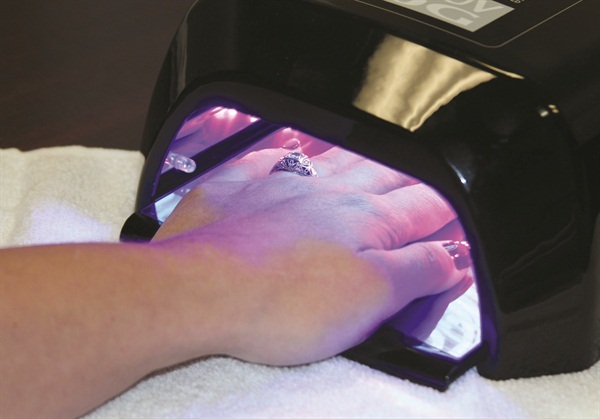 Finally, we could choose a different brand of gel-polish that cures more quickly with an LED light rather than a UV lamp, emitting an even tinier amount of radiation. Client: Wow. So many options! You can find additional information on the topic of UV light safety compiled by the Nail Manufacturer Council on Safety (NMC) at www.probeauty.org/nmc. The NMC reminds techs that sunscreens must be removed from the nail plate prior to applying any type of nail coating since they can block adhesion. Care should be taken to keep implements and tools from coming in contact with sunscreen to avoid inadvertently transferring the sunscreen to the nail plate.